Sammy squirmed and wriggled. Sammy squealed and yelled. Sammy pulled as hard as he could, but the book ate him. Then it coughed up his bones and they clattered across the floor like wooden blocks. That's probably the worst passage from the book in terms of gore. I hadn't read it ahead of time (bad mommy) but luckily my daughter, although a bit shocked at first, seems to have liked the book overall and has asked me to read it several times now. My son, who generally is more scared of things like this, has read it a couple times too. I don't think he likes it quite as much as my daughter, though. The illustrations by Mark Fearing are fun and cartoon-like, which helps make it more funny than scary. But the book in the illustrations does look pretty frightening with its big teeth. And the characters look very scared, especially when the book has grabbed hold of them. So this is certainly not for the faint of heart! 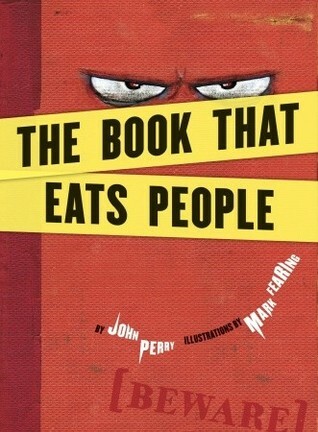 I'd recommend The Book That Eats People for those kids who like dark humor and will understand that this is a funny book, not a horror novel! It's fun to read aloud and will entertain the older crowd ~ I'd say elementary aged kids who aren't too sensitive to scary books. I have made sure the book stays in the hallway every night, just so we don't have the kids coming out of their rooms in fear that the book will eat them while they sleep! I'm linking up to What My Child is Reading at Mouse Grows, Mouse Learns. This review was written based on a copy of The Book That Eats People that I borrowed from the library. This sounds so cute! I get a scary book for my niece each year and the last two years they've wound up being her favorites. I was looking at the bookstore and didn't see anything at all! I was so disappointed but we are still a little ways from Halloween. I'll have to pick this one up and see what she says. It sounds super cute! Last one was I need my monster. So cute! And made monsters under the bed a funny, not too scary thing!